Those endpieces are just the comics section of the magazine, and rarely contain significant info. One of the things they DON'T mention is that water can form fifteen known types of ice. #17. Oregon State scientist have discovered that there may be more water in huge reservoirs underneath the oceans than in them. I recently saw a show (maybe on Discovery) where they said there are huge reservoirs of water under the surface of the Earth, not just the oceans. Shh. The Christians will say "See? The Bible was right. There IS water beneath the earth." 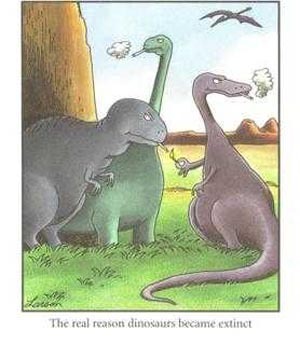 Actually, according to a Far Side cartoon by Gary Larson, the dinosaurs furtively smoked cigarettes, and that's why they died out. Cool article from Discover magazine about 20 unique things about water. Yes interesting......... Lots I didnt know!! If Christopher Columbus poured an eight once glass of water into the ocean and that water mixed evenly with all the water in the world and you poured yourself an eight ounce glass of water from the tap, there would be about 250 water molecules from CC glass in your glass. The water we drink today, it the same water the dinosaurs drank. It's gone through the water cycle a few billion times, but it's the same water. I have read before that there has never been any study to actually determine how much water a human should drink. I once had a doctor tell me the 8 glasses a day recommendation is overkill for the average person. He said drink enough to keep your urine a pale yellow color and you'll be fine. Natural water IS QUITE BENEFICIAL!!!!!!!! !